I have a 765 gallon, irregular shaped, sunken pond. It is a 45 mil. EPDM liner pond. It is a few weeks over 1 year old. It has a pH of about 8. It has a uv, a fountain, and a submersible filter with a water pump of about 625 gph. 2 of my adult fish died about 2 days ago. A calico Shubunkin goldfish and a big white comet. They got gill damage. They got it from being cooped up with 11 other goldfish. They were in a way too small 50 gallon tank, with no filter or aeration. They stayed in there for a day and overnight. My fault entirely. I should have known better. I got 2 new replacement fish for them today. A little yellow comet and another redheaded Shubunkin. They are both about 2 inches long. I live in the Arizona desert. Will the 2 new fish have time to build up their size and reserves before it gets too cold? <Should do, but depends on how mild your autumns are and how cold it actually gets in your winters. Remember, Goldfish can feed and metabolise down to 10-12 degrees C, using low protein foods such as wheat germ, but below that they shouldn't be fed anything at all until springtime rolls round and it warms up above 10-12 C. Very small Goldfish may do better overwintered indoors, and your 50 gallon tank should be ample for that. My pH is around 8. I have a 625 GPH submersible filter with a uv sterilizer and a fountain attachment. I just cleaned my 765 gallon pond. I started yesterday afternoon and finished this morning. I had to put my Shubunkin in a 50 gallon container with 11 other comet goldfish overnight. I about lost one of my comets. But that fish recovered and is doing fine. Now this one is acting strange. It is gasping at the surface of the water and darting around. The other fish are hiding in their fish shelters during the heat of the day. This is normal. Usually my Shubunkin hides with them. Not so today. I used a new type of pond bacterial additive too. It keeps coming up to me as if asking for help. Is my fish stressed because of the water change? Does it have gill damage? Is it just hungry? No red areas or streets that I can see. Some photos are provided below. In my last letter to you, do you recall me telling you about the comet goldfish I about lost? Well, turns out now that one is suffering from the same ailment as the Shubunkin. I am almost certain now these two suffered some sort of gill damage from their overnight stay in the 50 gallon tank with the other fish. What should I do with them? Do I humanely kill them? Or should I just wait and see? Thank you. The fish I wrote about in my 2nd email to you has died. Found her floating in the pond. Checked her gills before disposing of the body. They were a dark blood red. Is this a sign of gill damage? A photo of the dead fish is below. The 2nd fish was having the same symptoms as this poor fish. Will it die too? Thank you so much for all your help Neal. All my remaining fish are hiding this morning. Do you think it is due to stress from the pond cleaning? The Shubunkin is still alive as well. Thank you. I got an update for you on my sick Shubunkin. Found my poor Shubunkin dead today. It was up in one of the folds of EPDM liner I have in my pond. To whom ever can offer help that I desperately need! and 2 teaspoons salt according to directions. They are currently alive and seem a bit better. Now I need to get them home again. How and what do I treat the size pond now that it is refilled? I have on hand correct pH fizz tabs. Start Right and salt. My fountain pond filter is Beckett for 200 gal. Do I need a bigger one? Don't know how to test for hardness, pond was filled with house salt softened water has been re circulating without the filter part in place just the fountain pump. Nervous to put filter material ( bio balls and sponge material) back in pond as could be infected. Bio balls just cleaned and left in clean water in sun bucket. What would you recommend for filtering? 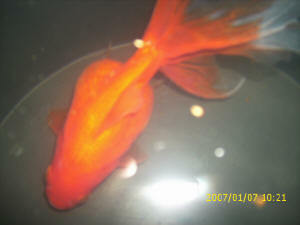 Food used for feeding is Tetra Pond Variety blend and Goldfish Crisps, should I be feeding anything different? P.S. It rained hard overnight. Last ? do barley balls really do what they say they will do? filtered by wet/dry filter(this tank has always been bullet proof for me). I hold these goldfish in here to establish breeding pairs or trios then relocate to outer pond. There are 4 fish and are about 4 inches in length, I've had for 5 months. parameters. The following day the remaining fish died. The fish actually looked as if they lost weight in the 48hours as well. Not quite sure what to make of this. Only thing I can think of, is my county water line was being worked on that day, a block or two away and my water supply was interrupted briefly that day. I did attempt to flush my line(by running water for 5mins or so) and water looked and smelt OK. Do you think a water additive being run thru the line killed these fish? but I waited another week. I purchased 5 small Koi from the pond store and introduced them to pond after acclimating them. Unfortunately I lost two fish because the were sucked into the bottom drain. I fixed that problem and added two more fish a few days later. One of those fish died within a couple of days, but we weren't sure if a predator had gotten in the pond and injured it. Everything was fine for a few days, except I couldn't get the fish to feed. They were hiding in the rocks and staying near the bottom. In the last few days they have become more brave and have been swimming around, but still not coming to the surface to feed. I have checked the water quality almost everyday and with the exception of hard water, everything else is good. the PH avg. is around 7.5. The nitrate/nitrite readings are 0. I have a few marginal plants and one water lily. Lately I have been losing a fish every 3 days or so. They seem to go from behaving normally to becoming lethargic and the soon after dead. I can't find any visible damage on them when I pull them from the water. should I remove these fish from the water and do a large water change?? I also have a couple of tadpoles in the pond. I don't see them much, but I did spy one swimming around and feeding the other day. He looked fine. I have a client with a pond, who has some goldfish that need your help! The fish are between 3-5 years old. Two are bloated (thought to be from improper nutrition/environment/husbandry) and one I am unsure what to think could be the problem. Possibly an infection of the liver? Or gases built up around the intestines from improper diet? 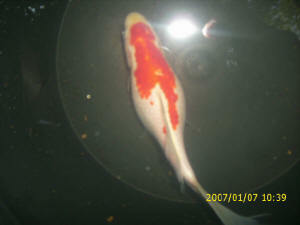 I have attached pictures to this email, these are the only three out of 8 fish to be affected in a 350 gallon pond. Any suggestions on what to do would be greatly appreciated. which alleviated after the water change/debris removal. This was 2 weeks ago. The water is still testing zero ammonia, zero nitrites, 15ppm nitrates, and the pH is stable around 7.3-7.5. I added magnesium sulfate at the rate of 1 g/L directly following the water change, and after a week of no feeding I bumped the level to around 2.0-2.3 g/L based on my calculations (hard to say due to a storm we had during the first week, the pond had overflowed some, so I dosed enough to bring the level from 1 to 2.5 g/L) I also started feeding a few peas every few days at the second visit. Still no results in the affected fish. I am also having issues obtaining pond plants that the fish will find palatable, as the owner agreed to have plants in the pond for proper nutrition. The reason I am having issues is the plants that are suggested on WWM are either illegal in South Carolina (Egeria sp., Pistia sp.) or are not being carried yet by my local nurseries, as it is still early in the pond season here. Do you have any other suggestions for palatable pond plants (palatable to the goldfish, of course!)? And do you have any suggestions for a quality commercial goldfish diet? He is a busy man, so I don't see him preparing peas and the like for his fish. He just wants a bag/container that he can pick up when relaxing in his backyard and feed a handful to his aquatic buddies. What is the highest/most effective concentration of Epsom Salt for bloat/dropsy? Would the affected fish benefit more from a 1-hour high-concentration bath? Please let me know what direction I should take, I want to help my client's goldfish live happy lives! I thank you in advance for all of your help! P.S. : Sorry about the glare in the pictures, it was the best quality I could get out of my travel camera. What would you suggest I offer the customer? Weekly/Bi-weekly water changes with debris removal and cleaning of filters? Feeding schedule/guidelines along with this? Or should I feed once per week if we choose to go with a weekly maintenance schedule? The customer wants some sort of time frame, is there no real reliable way to estimate this? I am not as much concerned with short-term revenue, as with long term contracts. The customer has indicated that a routine maintenance contract is viable as long as I can fix this problem. Should I tell him the only way to fix the problem is through a maintenance contract? I pride myself in honest, excellent customer service at a price that is better than my competition as well as a superior quality of service. I normally maintain aquariums, and my background is heavily in reefs and tropicals (where most issues I have either dealt with personally, or researched and assisted customers in resolving). I have been drawn more and more to ponds for various reasons ( both personal attraction as well as business reasons $$$) I want to keep this customer! I don't want to scare him off, resulting in another company immediately dosing the pond with loads of antibacterials before looking into the problem thoroughly (potentially causing more issues than before). The only reason I could think of to use antibacterials would be on the food (Kanamycin possibly? ), after 2-3 months of consistent, optimal water quality and nutrition. Do you agree? I have been in the hobby for almost 16 years, 7 of which have been in the service/retail industries. Any insight from someone with much more experience than myself is always appreciated. Also, did the pictures indicate nutritional issues? The two that are bloated seem to be, but the one with the lump under the skin I am curious about. 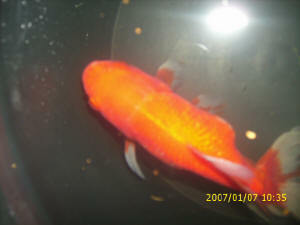 I have an outside pond which has been in existence for at least ten years and has a pump with a filter, last year in June after a water change I purchased a number of fish two Gold Koi, one Red and a Ghost Carp. During Autumn I cleared the pond of all leaves with a net, the fish have survived this harsh winter but recently one Gold Koi died after floating on the surface of the pond on its side, followed a few weeks after by the Ghost Carp which simply died no sign of floating on its side. Now the remaining Gold Koi has been swimming at the surface on its side for 3 days, it is still strong and seems determined to dive and is able to straighten out for a few seconds before returning to swim on its side at the surface. and I have read about the use of defrosted peas to help cure this ailment, which I'm a bit doubtful of, will this help? The Red Koi is fine and has always been fond of this last remaining Gold Koi, so it would be a shame if it is left on its own ha-ha. I'd be grateful of any further information you could give me to help rectify the problem. Unfortunately it died, but thanks for the advice. inside the house and brought them all in and using a 50/50 of water from the pond and fresh water and the suggested medication. As soon as I put them in there with the medication they are gasping at the surface, some on their side. I don't know if the Tetracycline is making them worst? Bob, Could you make out anything from the pictures? Should I continue the Tetracycline?